Eric Carle's The Very Hungry Little Caterpillar is one of the most recognisable and successful children's books of all time. This multi-award winning book was written and illustrated by American illustrator and children's book writer Eric Carle and it was published by the World Publishing Company in 1969. It is considered one of the greatest childhood classics of all time. The Very Hungry Caterpillar tells the story of a freshly hatched caterpillar who is so hungry so he eats his way through an enormous amount of food over the course of a week and then he gets a tummy ache and spins a cocoon for himself where he emerges later on as a big handsome butterfly. The Very Hungry Caterpillar is famous for its bright colours and unique illustrations. Carle used paper collages to illustrate the book and a hole punch to demonstrate the caterpillar chewing through one thing after another. The Very Hungry Caterpillar has been translated into over 62 languages and has sold more than 46 million copies since its publication which translates as one copy sold per minute. Eric Carle has received numerous awards for his work in children's literature including being nominated for the Hans Christian Andersen Award in 2010 which is an international award for children's literature that has been called the Noble Prize for Children's Literature. This July during the School Holidays Lakeside Joondalup will be visited by the Very Hungry Caterpillar himself! 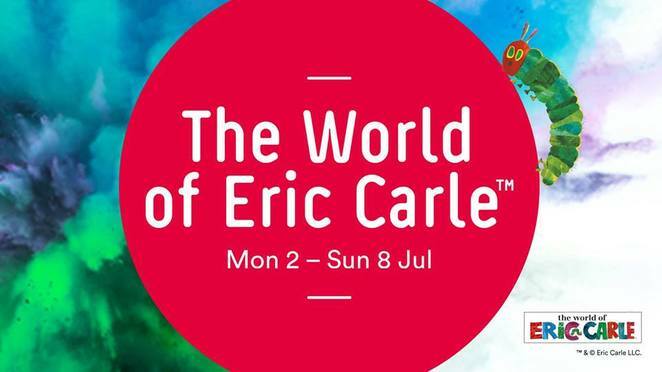 The World of Eric Carle will be at Lakeside Joondalup Shopping Centre from Monday, the 2nd of July to Sunday, the 8th of July from 11.00am to 2.00pm each day. There will be a Very Hungry Caterpillar craft village for the kids and you will be able to go on a scavenger hunt throughout the centre for a chance to win a prize! There will also be a reading zone where reading sessions of Eric Carle's books will be held every day at 11am, 12pm and 1pm for 30 minutes. You will even be able to meet the Very Hungry Caterpillar himself! For more information about this fun school holiday activity, check out Lakeside Joondalup's website or Facebook Page.